Porto Alegre, Brazília, 1994. szeptember 18. Több mint harmincan gyakoroltuk a shikantazát, de a kakas kukorékolása senkit se bírt kizökkenteni. Daigyo Moriyama Roshi was born in 1938 and raised in a layman's family. After graduating Philosophy department of Komazawa University in 1962, he was ordained by Hakusan Roshi. He practiced in the head temples of Soto Zen School, Eihei-ji, Soji-ji and Soji-ji Special Monastery. Then he moved to Tokyo branch temple of Eihei-ji and practiced under Niwa Zenji, the head abbot of Eihei-ji until 1979. Between 1970 and 1973, he served as the 7th head priest in 桑港寺 Sōkō-ji, a Soto Zen temple in San Francisco in U.S., (succeeding Suzuki Shunryu), and experienced dramatic growth of Zen Buddhism in the United States in 1970's. In 1980 near the Mount Fuji mountains, Moriyama Roshi founded Zuigakuin Zen Monastery to practice Bendoho, traditional teaching of Dogen Zenji and to promote Buddhism internationally. In Zuigakuin, without telephone or electricity, Moriyama Rôshi's disciples dedicate themselves exclusively to daily manual chores and to Zazen. 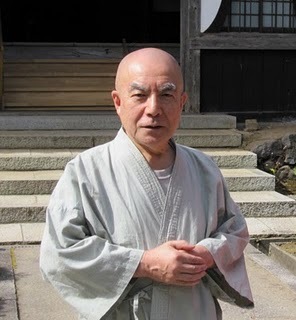 Moriyama Roshi accepts and teaches Japanese and non-Japanese practitioners, and also founded temples and Zen centers around the world such as in France, Uruguay, Brazil, Akita prefecture in Japan, Sweden. In 1992, he moved to Brazil and served as director of Soto Zen Buddhism Organization in South America several years. After retiring from the directorship, he continued his missionary work in South America and led various zen groups until 2002. Later Moriyama Roshi resided in Zuigakuin and is actively involved in teaching practitioners inside Japan as well as his disciples live outside Japan. He is also communicating with other Buddhist groups outside Japan to further promote international Buddhism missionary activity. Master Moriyama has not made any contact since the catastrophe of 11 March, 2011 has touched Japan. Our only information is that he could have been – or was – in the region that was affected by the Tsunami. reflecting Dōgen's early teacher Myōzen, as well as Nyojō. 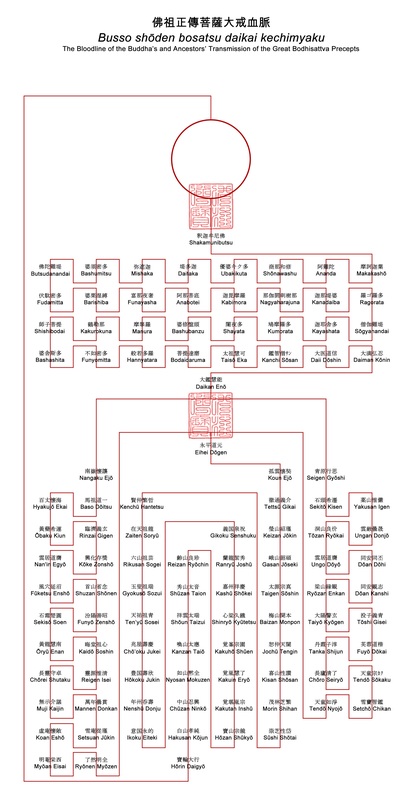 The Ancestral Line (given with the traditionally chanted Sino-Japanese pronunciations) begins with the names of the Seven Buddhas, starting with Bibashibutsu Daioshō down to the historical Buddha, Shakyamunibutsu Daioshō. The suffix butsu means Buddha and the word Daioshō that follows each name means Great Priest*. The Seven Buddhas are the Buddhas of this world, the first six being those who taught Shakyamuni. Collectively they can be considered as the endless succession of Buddhas of past, present, and future, and as representative of that which teaches beyond the world of appearances. Following Shakyamunibutsu is the list of those who became Shakyamuni and passed on the teaching, down to Hōrin Daigyō Daioshō. Zuigakuin conducts relations with many Zen groups and centers in the USA, Brazil and Europe. At any time several languages are spoken. Besides English also French and German, for the time being. A branch temple is located in the South of France under the direction of Rev. Joshin Bachoux, one of Moriyama-Roshi's dharma heirs. At least one week before coming to Zuigakuin send a letter (return postage appreciated) or fax, including your name, address, telephone or fax number, the date of arrival and intented length of stay. (The temple is closed from January to mid March.) Please bring loose clothes for zazen as well as working clothes. Keep in mind that the location is in the forest and at 700 m. of altitude, so it's always cooler than in the city. Also bring flashlight, toiletaries, towel and sheets. The charge is Y 4000 per day and decreases after the first week. For further information (also in English) contact Miss Fukushima at the Tokyo office. Zuigakuin is about one hour's hike from Hatsukari, the nearest station on JR-Chuo Line. The trail to the temple is well-marked and the local inhabitants can point the way. Hatsukari is about 2-hours from Shinjuku and Tokyo Station. It was a cloudy morning when I set out to visit Zuigakuin on Mt Takigo in Hatsukari. I'm now staying in Uenohara which is perched on a mountain. The JR station is located in the valley below on the other side of the Chuo expressway. I walked to the station below. Along the way birds of prey were circling above the mountain tops. There were very few people about. I passed a young girl walking her dog and a father pushing his child in a stroller. The ramps that connect the city to the JR station below provide wonderful vantage points to take in the surrounding scenery and beauty of the mountains. I stopped now and then to take in the greenery. The leaves were a deep green and some were turning colour. Hatsukari is about 30 minutes away on the Chuo line from Uenohara. I'm visiting Zuigakuin, a Zen temple and retreat house. I haven't called ahead to announce my arrival nor do I have a map as to how to get there from Hatsukari JR station. All I know is that the temple is about a hour and a half walk on foot from the station. I soon discovered that Zuikaguin is perched on top of Mt. Takigo, 700 meters above the JR station. The JR attendant gave me my starting point and told me to ask someone when I got to that point for directions. Then, a Japanese couple approached asking if they could be of some assistance. They were very kind and drove me to this point. They asked if I was planning to stay there. "No, I'm just visiting." I said. From there, I inquired at a garage and was told to follow the road beside it. So, I did and walked on. It was so quiet and the air was crisp and fresh. I could hear the gushing of water from the river running beside the road. I was sweating profusely. Sweat was dripping my forehead and flies hovered around my head. I could distinguish different birds sounds coming from the neighbouring woods. I was feeling a little nervous. Perhaps, I thought I should have called ahead. I continued on with my doubts. When the road forked up ahead, I was lucky to come upon an elderly Japanese woman who gently pointed the road to follow. When I came to a marker which read Zuigakuin 2 kilometers ahead, I thought great. Then I came upon another marker which read Zuigakuin 1 kilometer ahead. I thought I'm nearly there. Along the way, I passed a small Shinto Shrine. Its Torii was fashioned out of logs of wood. When I reached the two tall marble gate posts, one on either side of the road, to the entrance of the temple, I was excited. When I neared the temple which I could see through the woods, I heard the sound of a car approaching and pulled over to the side to let the car past. The driver stopped and rolled down the passenger window. It was Moriyama Roshi, the Zen master. By this time, I was sweating profusely and out of breath. I said, "Hello. I'm visiting the Zen temple but don't have an appointment. I hope it's okay." He got out of the car and introduced himself. He got back in and then asked if I wanted a ride up. My aching feet told me to say yes, so I did. He escorted me inside and told me to take a rest inside a lovely tatami room which overlooked the surrounding nature. On the walls of the tatami room hung photographs of Moriyama Roshi, his disciples, and students. There was a shelf with literature, some of his books, and Zen material. He asked me how much time I had and I said "a little" since I didn't want to intrude on his daily routine. We spoke in English which was a relief since my Japanese is very poor. After that, we visited the living quarters and the kitchen. The Hondo, living quarters, and kitchen are fashioned out of a 200-year-old farmhouse that he has lovingly restored. The house is without electricity. Water is drawn from a neighbouring stream and filtered. Water for bathing is heated in a steel drum. Gas burners are used to cook simple, vegetarian fare. He served me green tea. The center welcomes novices, lay practitioners, and guests who want to get away from it all and experience communal living in a Zen environment. Moriyama-san's lineage goes back to Dogen, the founder of Zen Buddhism in Japan. Moriyama-san spent 6 years in Brazil. Dogen found enlightenment in China and brought back his knowledge, the transmission of light, to Japan over 700 years ago during the Kamakura period. Before leaving, I paid another visit to the Hondo to leave a donation to show my appreciation and for being graciously welcomed without an appointment. I left with the knowledge that I had come across an enlighted being, an arhat, whose presence I won't forget. The descent to the station was invigorating and the quiet filled me with a sense of peace. As I was getting closer to the JR station, I encountered two groups of hikers whose loud animated conversations jolted me back to reality. The JR attendant asked me if I made it okay, I replied "Daijobu des", which means okay. He smiled. While I waited for the train to arrive, I contemplated the beauty of Zen. What we can learn from practicing Bendo-ho? In June 17th to 19th, 2010, July Sesshin was held in Zuigakuin. In the Sesshin, Roshi gave a Dharma talk. It is the best to listen Roshi's talk on live. However, for people who could not attend the talk, I (Tessan Abe) will post some of major topics as much as I could understand. Your comments and questions are always welcome. Moriyama Roshi said, "Zuigakuin is a place to practice Bendo-ho. I hope all practitioners can practice together to familiarlize yourselves with the ancient traditional practice method, Bendo-ho. The Bendo-ho was created by Zen Master Dogen 800 years ago. Practicing such things may be like you are experiencing a totally different culture even if you are Japanese. But, I want you to learn something from your experience in Zuigakuin and bring them back to your daily life. Bendo-ho is formed with sets of directions and rules set by Zen Master Dogen with respect to each of activities to be conducted in life of Sodo (Monk hall) or temple. Here, the activities include not only manners of Zazen (sitting meditation) and chanting sutras, but also include manners on how to enter the monk hall, how to eat a meal, how to wash your face, how to sleep, etc. The directions and rules were set to concretely illustrate how you should behave or act in each of the activities in order to practice the Buddha way without any misunderstanding and without any delay. Indeed, the practicing in Zuigakuin without electricity and modern convenience is like the experiencing a different culture. However, at the same time, the experience of a different culture also provides a chance to revisit your own daily life. Think about a trip to a foreign country. You must surprise to see life style or culture different than yours. And, at the same time, many of you must aware your own present culture more and more. In Zuigakuin, the different culture you are experiencing is nothing but the ancient traditional practice of Buddha way. It is like you are chanting sutras to familiarize yourself with Buddha's teachings. By practicing Bendo-ho or living under it, whether you are aware or not, you are familiarizing (not just learning as knowledge) yourself with the teachings of Zen master Dogen through your actions to body and mind. "Learn something through the experience of practicing Bedo-ho", said Moriyama Roshi. Roshi didn't say you should practice the same Bendo-ho in your home. The experience of Bendo-ho provides an opportunity to revisit your own daily life under light of the ancient traditional practice method of Buddha way. The practice of Buddha way is never limited in Zazen or chanting of sutras. Every action in your daily life is the practice of Buddha way. The important point is to devise a way to use or adopt spirits of Bendo-ho in each one's own daily life beyond difference in a culture or life style. 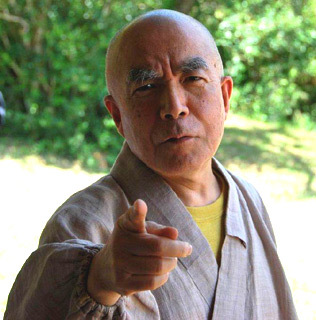 This is the second part of the article regarding on Moriyama Roshi's talk during July Sesshin. It has been a long time since the last time I posted the first part. 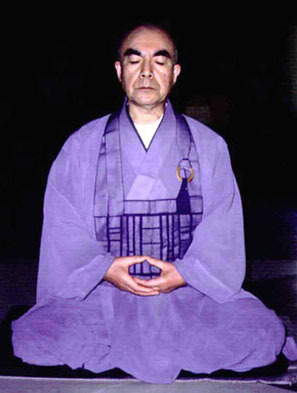 In Sesshin Moriyama Roshi also said, "The important point of Zazen (sitting meditation) is in part other than Zazen. Of course it is important to do Zazen when you practice Zazen. However, it doesn't mean all you have to do is good Zazen. In addition to Zazen, you also have to do well as a Buddhist in activities other than Zazen such as the manner of eating, the manner of chanting sutras, how to walk, how to speak, every activity in daily life. In Bendo-ho, rules to be followed in every aspect of a daily life in Zen Monastery community. By learning those rules in Bendo-ho, I am hoping that you review your own daily life in light of Bendo-ho and contemplate how you should live your own every day life." In a society, every individual is assigned with multiple roles. For example, if you a middle aged man, you may be a boss and a subordinate in your work, a husband and a father in your home. And for his own parents, he may be a child. For his brothers, you may be a younger or older brother. It is the best if your Buddhism practice comes only after you have performed all the roles satisfactory. Buddhism practice is to deepen part of an individual self, which still exists apart from all those roles. Once you are able to deepen such a part (the part independent from all those responsibilities), you will be in turn able to do better in your social and family life. “Various scales are used to measure the depth of Zazen, the sitting meditation. There are five levels in the depth of Zazen in considering a factor of time which I personally experienced during Zazen. Level 1: your thought is filled with delusions. In Zazen, there is no “static” condition to be aimed at as the final goal. The important point is “dynamic” actions of adjusting your posture, breath and mind in each and every moment. General idea and manner of Zazen are described in FukanZazengi (Universal recommendations for Zazen). However, you should consult with Moriyama Roshi or your teacher regarding details and specific part of Zazen until you are fully convinced. There are so many different methods for Zazen and meditation in this world depending on religion, lineage and teacher, such as Nen-soku (paying full attention to breath), Su-soku-kan (counting breath), Nai-kan (internal observation), samatha, vipassana, mindfulness meditations, etc. Practitioners aware that only the awakened teacher can teach you what kind of Zazen is suitable for you in that time. Né dans l'extreme Nord du japon, dans l'ile de Sakhaline - occupée depuis la guerre par les soviétiques. A 22 ans, finissant des études de philo a Tokyo, il rencontre son Maître Hakusan Kôjun Rôshi (rôshi: vieux Maître; titre honorifique). Il commence a pratiquer zazen, et impressionné par la dignité et la compassion vivante du Roshi, il décide de devenir également moine. Il est ordonné a l 'âge de 24 ans. Il passe ensuite une année a Eiheiji, le temple fondé par Maître Dogen. Puis 5 ans a Sojiji, le temple de Maître Keizan Jokin, ou il poursuit sa pratique de moine, et commence les cours spéciaux pour futurs enseignants. Il reçoit la transmission de son Maître, Hakusan Kôjun Rôshi. Son Maître l'envoie aupres de son frere 'dans le Dharma', Niwa Roshi pour compléter sa formation. Il restera 2 ans a la branche de Tokyo de Eiheiji, comme assistant personnel (Jisha) de Niwa Zenji. Celui-ci lui demande alors d'aller a San Francisco, reprendre le temple précédemment dirigé par Suzuki Roshi (celui-ci a quitté ce temple pour fonder le Zen Center). Ce sera la premiere rencontre du Roshi avec l'occident: le San Francisco de la fin des années 60! Grand choc, et grande admiration pour la force de la pratique des occidentaux. Apres 3 ans, Moriyama Roshi revient au Japon, aupres de Niwa Roshi; a ce moment il est enseignant, puis Ino (Maître enseignant aux moines). Apres 6 ans il reçoit le titre de Shike (Maître de monastere). Aidé par ses Maîtres il fonde Zuigakuin dans la montagne japonaise. Zuigakuin est un petit temple, consacré a la pratique telle qu'elle est exposée par Maître Dogen. : méditation (zazen) et travail (samou) -la pratique inclut aussi Takahatsou (recherche d'aumônes), renouant ainsi avec la tradition bouddhiste des moines mendiants et pauvres- l'autre source de revenus est seulement les dons faits par les visiteurs et les disciples. Peu de confort -pas d'éléctricité, ni de téléphone, peu de chauffage- mais riche du Dharma, et ouvert a tous: japonais ou étrangers, hommes ou femmes, seul compte le désir de pratiquer et de suivre la voie des Patriarches; une vie simple, précieuse, une pratique rare dans le Japon actuel, c'est le don de Maître Moriyama a tous ses disciples. Le temple a été ouvert en 1978, le Zendo achevé en 1980 (une grande cérémonie de 20eme anniversaire est prévue en l'an 2000!). En 1992, Maître Niwa demande a Moriyama Roshi de repartir, cette fois en Amérique du Sud. Maître Moriyama sera nommé Sokan (responsable national). Il habite Sao Paulo, ville d'émigration de nombreux japonais apres-guerre. Il reconstruira le temple de la communauté, et créera des groupes de zazen pour les brésiliens, a Sao Paulo et dans d'autres villes du Brésil. Sa disciple Joshin Sensei commencera des groupes de zazen en Argentine, en Uruguay et au Chili. Mais désireux de poursuivre sa voie simple de moine, Maître Moriyama, lorsque tout est mis sur pied démissionne et regagne Zuigakuin, ou il continue a accueillir visiteurs et pratiquants, jusqu'au début de l'année 2000 ou il repart pour le Brésil, a Porto Alegre pour y diriger un nouveau temple. 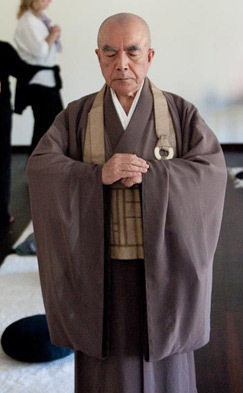 Kôjun Noiri Roshi (roshi: vieux Maître; titre honorifique) est maintenant agé de 85 ans. Il vit au temple de Kanyô-an. C'est maintenant sa disciple, Myozen Terayama Roshi, qui s'occupe du temple et des disciples. Kojun Roshi est célebre au japon pour 2 choses: d'une part... sa sévérite envers ses disciples! C'est un maître strict, qui a dédié toute sa vie au Dharma. Il a suivi les préceptes des moines, sans famille, mais aupres de son Maître puis avec ses disciples. Il a reçu l'enseignement des Maîtres de l'Ecole Soto et il a retransmis a tous les disciples assez courageux pour affronter la force de la "Montagne Blanche" (Haku San). Il a eu deux successeurs, la nonne Myozen Roshi et Moriyama Roshi. Il est également un grand lettré, spécialiste des caracteres chinois. Il fut le premier a faire imprimer les poemes écrits en chinois par Maître Dogen, le Eiheikoroku. Comme une grande montagne, Kojun Roshi passe quotidiennement une grande partie de la journée en méditation. Zuigaku Rempô Niwa Zenji est né à Shizuoka, au Japon. En vertu du système de transmission familiale des temples introduit par la réforme de l'époque Meiji, il se fit moine assez tôt, après ses études au lycée de Shizuoka. Selon le système inauguré au XVIII° siècle par Menzan, il reçut la transmission du Dharma (shiho) trois ans après avoir pris les préceptes. Il fut pour cela adopté par le supérieur du temple Tokei-in, de Shizuoka, selon un système complexe de rotation entre plusieurs temples de la localité, occasion à laquelle il prit le nom héréditaire de Niwa. A 50 ans, il fut nommé supérieur de la branche de Tokyo du temple Eihei-ji. Fervent pratiquant de zazen, il y fit reconstruire le zendo (salle de méditation) afin que les jeunes en formation (pour la plupart fils de chefs de temple) puissent revenir à cette pratique essentielle. Il devint ensuite le supérieur du Eihei-ji, dans les montagnes du Fukui (mer du Japon). Ainsi qu'à Tokyo, il y pratiquait zazen tous les matins avec les moines, selon les enseignements du fondateur du lieu, maître Dôgen. Il a été le maître de Gudo Nishijima et de Moriyama Daigyo. Après la mort de T. Deshimaru, trois de ses plus proches disciples ont été certifiés maîtres dans la tradition du zen soto, par Niwa Zenji, sans jamais avoir connu Stéphane "Kosen" Thibaut, Etienne "Mokusho" Zeisler et Roland "Yuno" Rech." "Zenji" car il fut le précédent supérieur du temple de Maître Dogen, Eiheiji. C'est la plus haute position de l'école Soto Zen. Il est mort le 7 septembre 1993. Niwa Zenji est né dans un temple de haut rang, lié a l'aristocratie. Il devint moine tres tôt, puis Maître et fut nommé a 50 ans supérieur de la branche de Tokyo du temple Eiheiji. Il y fit reconstruire un nouveau zendo (salle de méditation) car lui meme pratiquait beaucoup le zazen et il souhaitait que les religieux venus faire leurs années de formation pratiquent également de façon plus intensive. Puis il devint le supérieur du temple de Eiheiji auquel il imprima un nouvel élan, venant chaque matin pratiquer avec les moines, redonnant a ce lieu le gout du Dharma de Maître Dogen. Il devint aussi un grand soutien pour les groupes de zen a l'étranger: ainsi, comme il est de tradition pour les Zenji de faire entrer dans leurs lignages ceux qui pour une raison ou pour une autre n'ont plus de Maître, il donna sa transmission a plusieurs disciples de Maître Deshimaru, a la mort de ce dernier. Il aida Maître Moriyama a commencer Zuigakuin, puis il aida également la disciple de ce dernier, Joshin Sensei, a fonder la Demeure sans limites. Nous avons tous, pratiquants en Europe, une grande dette de gratitude envers lui! Moriyama Roshi has disciples in Brazil, USA, Argentina, Uruguay, France, Germany, Sweden, Austria, Canada, Korea and Sri Lanka. Nom de dharma: Zuimyō 瑞妙: Bonheur (spirituel) merveilleux – Jōshin 淨信: Foi pure. Après avoir pratiqué en Europe, Joshin Sensei part pour le Japon. Elle passe plusieurs années à 瑞岳院 Zuigakuin, où elle est ordonnée, puis elle y reçoit le Sceau de la transmission de Maître Moriyama, devenant ainsi enseignante de l'école Soto Zen. A la demande de ce dernier, elle rentre en France pour y partager l'enseignement reçu à la Demeure Sans Limites. Elle a fait également de nombreux séjours en Amérique du Sud pour y aider son Maître. Elle a ouvert en 2006 Le Chemin du Vent à Vaudevant (Ardèche) pour ses étudiants les plus anciens et voyage pour donner des conférences ou diriger des retraites. Elle collabore au supplément « Les Essentiels » du magazine La Vie depuis cinq ans. Elle a été ordonnée à Zuigakuin en 1999; elle vit à la Demeure sans Limites. Durant ses années de formation, elle a effectué plusieurs « angos » (retraites de trois mois) aux USA auprès de Bennage Ni-Osho et également au Japon, auprès de Maître Aoyama Shundo, nonne et Supérieure du monastère de Nagoya, auteure de « Graines de Sagesse ». Elle est revenue d'une retraite de deux ans et demi au Nissodo - monastère des nonnes du Soto Zen au Japon - au printemps 2013. Elle y a reçu la transmission de l'abbesse, Aoyama Shundo Roshi, et a accompli les deux cérémonies de "Zuisse" - certification- à Eiheiji et Sojiji. Jokei Ni a aussi fait plusieurs séjours au Village des Pruniers. C'est elle qui accueille les personnes qui viennent pratiquer à la Demeure sans Limites et dirige les retraites. Nasceu em Março de 1938, no extremo norte do Japao, conhecido como ilha de Sakhaline - ocupada depoisa da guerra pelos soviéticos. Aos 22 anos,conclui seus estudos de filosofia em Tokyo, e reencontra seu mestre Hakusan Kojun Roshi. Ele começa a praticar o zazen, e impressiona pela dignidade ecompaixao viva de um Roshi. Decide tornar-se monge. É ordenado com a idade de 24 anos e passa um ano em Eihei-ji, templo fundado por Meste Dogen. Durante 5 anos em Soji-ji, um templo fundado por mestre Keizan Jokin, ele realiza a prática monástica, e inicia um curso especial para transformar-se em professor do Dharma. Ele recebe a transmissao de seu Mestre, Hakusan Kojun Roshi. Seu mestre o envia par seu irmao do Dharma, Niwa Roshi para completar sua formaçao. Ele ficará 2 anos na seçao de Tokyo do Eihei-ji. 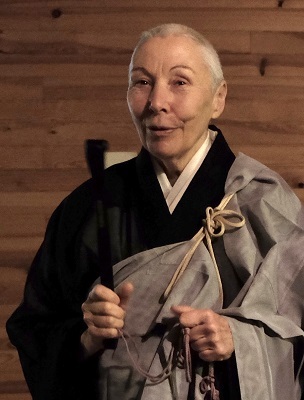 Niwa Roshi lhe pede entao para ir a Sao Francisco, na Califórnia, USA, retomar o templo precedentemente dirigido por Suzuki Roshi (este havia se retirado deste templo para fundar o Zen Center. Esse seria o primeiro encontro de Roshi Moryama com o ocidente - o Sao Francisco do fim dos anos 60! Grande choque, e grande admiraçao pela força da prática dos ocidentais. Após 3 anos, Moryama Roshi volta ao Japao, junto a Niwa Roshi, nesse momento ele é professor, depois Ino (Mestre professor de monges). Depois de 6 anos ele recebe oo título de Shike (Mestre de monastério). Ajudado por seus mestres ele funda o Zuigakuin nas montanhas japonesas. Zagakuim é um pequeno templo, consagrado a prática tal como ela é exposta por mestre Eihei Dôgen: meditaçao (Zazen) e trabalho (Samu) - a prática inclui também Takahatsu (pedir esmolas), reatando assim com a tradiçao budista dos monges mendicantes e pobres - a outra fonte de renda é somente doaçoes feitas pelos pelos visitantes e discípulos. Pouco conforto - nada de eletricidade, nem telefone, pouco aquecimento - mas rico de Dhrama, e aberto a todos: japoneses e estranjeiros, homens e mulheres, o único que conta é o desejo de praticar e seguir o caminho dos Patriarcas; uma vida simples, preciosa, umma prática rara no Japao atual, é o dom de Mestre Moryama a todos os discípulos. O templo foi aberto em 1978, o zendo terminou em 1980. Em 1992, Roshi Niwa pede a Moryama para partir, desta vez para a América do Sul. Mestre Moryama foi nomeado Sokan (responsável nacional). Ele mora em Sao paulo, cidade de emigraçao de numerosos japoneses após-guerra. Ele reconstrói o templo da comunidade, e cria grupos de Zazen para brasileiros, em Sao Paulo e em outras cidades brasileiras. Sua discípula Joshin Sensei começará grupos de zazen na Argentina, no Uruguai e no Chile. Mas desejoso de seguir a vida simples de monge, Meste Moryama quando tudo está em ordem se demite e volta a Zuigakuin, onde continua a acolher visitantes e praticantes até o início do ano 2000 quando parte para Porto Alegre no Brasil, para dirigir um novo templo. Em sua ausencia, Zuigakuin nao ceita mais os visitantes estrangeiros e as pessoas interessadas podem dirigir-se a "Demeure Sans Limites", aí onde prosegue seu Dharma, através de sua sucessora Joshin Sensei. Moryama tem ministrado ensinamentos tanto para monges quanto para discípulos leigos, por mais de 30 anos. Desde o início, sempre teve especial interesse em acessar a prática do Zen para pessoas que nao tem experiencia anterior no Budismo. Em 26 de fevereiro de 1998 Roshi Moriyama concedia uma entrevista para Revista Bodigaya em que declarava "eu tenho um novo projeto. O Grupo VIAZEN vai iniciar a construçao de um Centro de Treinamento Zen nas montanhas". 1993-96 - Monge Superior do Templo Bushin-ji, em Sao Paulo, Brasil. Nessa ocasiao, teve seu primeiro contato e visita a ViaZen, em Porto Alegre. Fevereiro de 2000 - Muda-se para Porto Alegre, Brasil. Moriyama Roshi nasceu em março de 1938, no extremo norte do Japão, na ilha de Sakhaline. Aos 22 anos concluiu seus estudos de filosofia em Tokyo, e encontrou seu mestre Hakusan Kojun Roshi. Foi ordenado com a idade de 24 anos, em seguida permaneceu um ano no Templo Eihei-ji. Depois, durante 5 anos, realizou a prática monástica no Templo Soji-ji e um curso para se tornar professor do Darma. Recebeu a transmissão do Darma de seu Mestre, Hakusan Kojun Roshi. Seu mestre o enviou para seu irmão do Darma, Niwa Roshi, para completar sua formação. Ele permaneceu 2 anos na seção de Tokyo do Eihei-ji. Niwa Roshi lhe pediu para ir para São Francisco, na Califórnia, USA, retomar o templo precedentemente dirigido por Suzuki Roshi. Esse seria o primeiro encontro de Moriyama Roshi com o Ocidente - São Francisco do fim dos anos 60. Segundo ele, foi um grande choque e uma grande admiração pela força da prática dos ocidentais. Após 3 anos residindo nos Estados Unidos, Moriyama Roshi voltou ao Japão, junto a Niwa Roshi, onde se tornou professor e Inô. Depois de 6 anos, ele recebeu o título de Shike (mestre de monastério). Ajudado por seus mestres, ele fundou o templo Zuigakuin em uma região montanhosa do Japão. Zuigakuin é um pequeno templo consagrado à prática tal como ela é exposta por mestre Eihei Dogen: Zazen e Samu - a prática inclui também Takahatsu (pedir esmolas), revivendo a tradição dos monges mendicantes. O templo é bastante austero, não há eletricidade, telefone e aquecimento; mas é muito rico no Darma e sempre esteve aberto a todos interessados, sejam eles japoneses ou estrangeiros. O templo foi oficialmente aberto em 1978, e o Zendo foi concluído em 1980. Em 1992, Roshi Niwa pediu a seu discípulo para partir novamente, mas desta vez para a América do Sul. Assim, mestre Moriyama foi nomeado Sookan (representante da Soto Zen para a América Latina) e passou a morar em São Paulo, onde reconstruiu o templo da comunidade, Busshin-ji, e criou grupos de Zazen em várias cidades do país. Em 1994 conheceu a Sanga de Porto Alegre. Nesta mesma época Moriyama Roshi deixou o cargo de Sookan e voltou para seu templo no Japão. Durante os anos seguintes, realizou visitas ao Via Zen, até que se mudou definitivamente para Porto Alegre em 2000. Em 2001 é publicado, no Brasil, seu livro "Primeiros Passos no Zen”, compilado a partir de textos coletados por seus alunos e entrevistas concedidas à Editora Bodigaya. Os ensinamentos contidos nestes Primeiros Passos do Zen podem ser considerados parte da chamada "transmissão oral” de mestre à discípulo, colhidos "aos pés do mestre”, no dizer de Enio Burgos, tradutor e editor. Em 2005 Moriyama voltou para o Japão para cuidar de seu mestre. Realizou uma nova visita ao Brasil em 2009, quando se comprometeu a vir uma vez por ano para orientar Sesshins e transmitir ensinamentos. Em 11 de fevereiro de 2011 estava com uma visita agendada ao Brasil, mas, devido a uma lombalgia grave, cancelou a viagem por ordem médica. Em 18 de fevereiro, após ter pernoitado em um Templo de um amigo em Tóquio, foi visto pela última vez ao tomar um taxi até uma estação de trem. Seus discípulos passam a procurá-lo, mas encontram muitas dificuldades em suas buscas após 11 de março, quando ocorreu um Tsunami no Japão, deixando todo o país em estado de emergência. Sem ninguém saber seu paradeiro, em julho de 2011 é dado como desaparecido pelo governo do Japão. Já se passaram cinco meses sem nenhuma notícia de Moriyama Roshi. Apesar de investigações, neste momento não se sabe nem as condições e nem o que pode ter ocorrido. Atualmente o templo Zuigaku-in está fechado. Quanto à reabertura do Templo Zuigaku-in e sua programação, por favor entrar em contacto com o templo Kissho-in. Aqueles que desejam praticar o zazen em meio à natureza devem se dirigir ao zendo do templo Kokenji. O monge superior do templo, Sensei Sato fez o seu treinamento com o mesmo mestre de Moriyama Roshi. O blog Zuigakuin será encerrado até o final de agosto. Para posteriores notícias sobre Moriyama Roshi, favor acessar o blog "Shibaura Zazenkai." Como continuação da vida de Moriyama Roshi, a Sanga do Via Zen aspira honrar sua caminhada e anos de dedicação a essa comunidade, realizando seu projeto de constituir um Mosteiro internacional para o benefício de todos os seres. Falarei hoje sobre Buda, que foi um príncipe indiano e se rebelou contra as correntes religiosas de seu tempo, o hinduísmo e o bramanismo. Ele se insurgiu contra a hierarquia e o elitismo que existiam nelas. Como todas as religiões, o budismo tem uma história cíclica: nasceu, se desenvolveu e se hierarquizou. E quando isto acontece com uma religião, ela perde sua vitalidade, perde o verdadeiro espírito do Dharma. Mas o Dharma continua existindo, com sua criatividade faz com que surjam novas tendências e abordagens religiosas, e assim se revitaliza. Buda não fundou uma religião. Simplesmente passou a viver e atuar de outra maneira quando se iluminou. As pessoas, percebendo isto, começaram a segui-lo e a querer viver como ele. Quando chegou à China, o budismo foi aceito pelos imperadores, que construíram muitos templos, imagens, estátuas, e assim o institucionalizaram. E o espírito do Dharma foi esquecido. A origem do zen está em Bodidharma, que vindo da Índia encontrou essa situação, afastou-se dela e foi viver nas montanhas pouco povoadas. Os primeiros monges zen viviam procurando a autenticidade, o primitivo espírito do Dharma. Acho que os monges zen modernos também buscam a autenticidade. Eles são como novos hippies, anti-establishment, e por isso existe neles a energia do Dharma. Eu também quero trabalhar assim. Recebi este estranho título de sokan, chefe do soto zen, não para tentar expandir o zen, mas para continuar com a minha prática. E eu quero praticar, gosto da prática, gosto de zazen e gosto de ajudar as pessoas que querem praticar. O ano passado, quando vim assumir meu templo na comunidade japonesa de São Paulo, surpreendi as pessoas. Penso que elas esperavam encontrar uma alta autoridade religiosa, ricamente vestida, com belas túnicas, e me viram chegar com uma mochila nas costas. E eu continuo assim, vou de minha casa para o templo diariamente com a mochila nas costas, e as pessoas ficam espantadas comigo. Mas eu quero ser monge. E é por isso que gosto de Porto Alegre. Aqui encontrei este mesmo tipo de prática. E apesar de ser um homem muito ocupado com questões administrativas, com dinheiro, com cerimônias e funerais para oficiar e um templo para cuidar, e mesmo tendo minha vida privada, venho a Porto Alegre e aqui estou novamente. Gostaria de lembrar que existem três pontos essenciais no zen: a sabedoria, o samadi e os preceitos. Se a prática for mantida, se fizermos zazen, naturalmente os preceitos serão seguidos e naturalmente a sabedoria virá e irá se aprofundando. Ontem falei sobre Buda, hoje falarei sobre Dogen. Dogen tem a mesma importância, para os budistas japoneses, que Buda teve para o budismo na Índia. Ele começou a ensinar há 750 anos. Quando jovem, teve muitos mestres japoneses, mas nenhum o satisfez. Era um intelectual e os velhos budistas japoneses eram eruditos, mas faltava-lhes o verdadeiro espírito do zen. Os japoneses não liam o páli nem o sânscrito. Por isso, iam à China procurar ensinamentos traduzidos para o chinês. Dogen tinha 24 anos e estudava com um mestre da escola Tendai, em Kioto, quando resolveu abandonar tudo e ir procurar um professor de budismo na China. Suponho que atingiu a iluminação, reconhecida por seu mestre, e então voltou para ensinar no Japão. E com a volta de Dogen, o budismo japonês foi ficando cada vez mais forte. Naquela época existiam várias correntes budistas — terra pura, nichirem e outras — que se desenvolviam em torno de um sutra trazido da China e transformado em texto sagrado. Dogen trouxe da China uma abordagem diferente, que aprendeu com a genuína prática monástica do dia-a-dia. Como o Zuimonki-Shobogenzo está para ser publicado em português, vocês poderão ler, em breve, os ensinamentos de Dogen sobre a vida monástica, anotados por seu discípulo Ejo. Vocês, estudantes de zen, conhecem e vivenciam a principal prática da vida monástica, o zazen, e com ela conseguirão atingir a essência deste tipo de vida. Essa prática irá desenvolver todos os níveis de sua atuação, sua compaixão, sua energia, sua inteligência e intuição. Todas essas qualidades serão refinadas. Estou dizendo isso baseado na intuição, não sou um erudito, mas a prática irá melhorar a sua capacidade de adaptar-se, de estar alerta, atento e autoconfiante. Aos poucos, essa capacidade leva a uma forte integridade de caráter e a um aprofundamento da sabedoria. Praticando a religião, cada um de vocês vai se tornar um ser humano cada vez mais completo. Hoje vou falar sobre os mosteiros zen do Japão e sobre como fui para o mosteiro de Eihei-ji depois que recebi a ordenação de meu mestre. No soto zen existem várias regras, e quem deseja se ordenar monge deve seguir várias etapas de treinamento. Quando eu era estudante universitário de filosofia, não levava os estudos muito a sério. Estudava, mas não tinha talento especial para essa matéria. Meus professores vinham sempre com textos em inglês, francês, latim, grego, sânscrito, mas nunca em japonês. Eu gostava de usufruir a vida, gostava de arte, de música, de literatura, e assim passei pela universidade, mas quando me formei tive que tomar um rumo na vida. Estudando filosofia hindu e budismo, eu ficara muito interessado pelo budismo primitivo e o zen. Comecei, então, a prática de zazen. Eu queria conhecer aquela prática. Naquela época, existiam muitos grupos de zen, muitos mestres, mas nem todos eram bons mestres. No último ano da universidade visitei vários deles, até que um amigo me levou a um, não muito famoso, mas que era o mestre que foi meu mestre. Meu primeiro encontro com ele me deixou uma impressão muito forte. Nenhum dos outros mestres que eu conhecera era como ele. Seu templo era pobre, ele era um profundo conhecedor do Shobogenzo e praticava a disciplina estrita, os preceitos, o celibato, a mendicância, e lá pude começar a compreender o zen de Dogen, que era muito diferente de nossa vida moderna, era uma vida simples que eu não encontrara em nenhum outro lugar. Com meu mestre compreendi que este outro tipo de vida era possível, que existia o tipo de vida descrito por Dogen. Decidi de repente ser seu discípulo, pedi que me aceitasse e ele concordou. Minha família foi contra essa decisão. Disseram que eu não tinha sido um bom aluno, que não tinha sido um bom estudante, que eu estava louco. Mas continuei com minha escolha e pouco depois meu mestre me mandou para o tangaryo. (Antes de entrar para um mosteiro, deve-se ficar sete dias em uma pequena sala anexa, fazendo determinadas práticas.) Antes, quando era estudante, eu lia até tarde, ficava ouvindo música, ia dormir às três da manhã. No mosteiro minha vida se inverteu totalmente. Lá, a disciplina era muito rigorosa, o regulamento muito estrito, eu dormia de quatro a cinco horas por noite e passei a acordar no horário em que antes ia dormir. A lembrança que me ficou desse mosteiro é de que eu estava sempre com fome, sempre com sono e sempre trabalhando demais. O treinamento era muito duro e havia estranhas regras, como levantar às três e ficar até as dez da noite fazendo zazen. Podia-se ir ao banheiro e comia-se três vezes ao dia. Foi um teste duríssimo. Esse treinamento especial durava sete dias, mas o monge chefe me odiava e me fez fazer três dias a mais. Na época, meu zazen era muito ruim, zazen de diletante, em que as pernas doem tanto que a dor vai subindo até o abdome, vai para o tórax, depois para a cabeça e aí começa a doer o corpo inteiro. Comecei a ter alucinações, a ver coisas ao meu redor. Uma vez vi uma flor brotando e crescendo na minha frente. Ela ia crescendo aos poucos. Pensei que estava iluminado e fui contar para o monge chefe, que me deu uma forte bordoada com o kiosaku e disse: "Você está louco, isso não é iluminação." Depois de dez dias desse treinamento, recebi autorização para estudar normalmente no mosteiro. Mas eu me sentia enfraquecido, estranho, tonto. Um dia, lavando o rosto, vi refletida na água a face de um animal que parecia um lobo. Olhando melhor, percebi que era a minha face e que eu estava mudando. As refeições no mosteiro eram arroz com gergelim e sal pela manhã, sopa de arroz com legumes ao meio dia e, à noite, sopa de massa com algumas verduras. Eu me sentia muito fraco e doente, como se estivesse convalescendo num hospital. Um dia, quando eu estava a ponto de desmaiar, o monge chefe me trouxe um pequeno copo com uma bebida deliciosa. Meu corpo estava dolorido e insensível e tive a sensação de nunca ter bebido nada tão doce, tão maravilhoso, como um néctar divino. Perguntei ao monge que bebida era aquela, e ele respondeu que era um pouco de água morna com açúcar. "Ah", pensei, "então é isto o que estou bebendo...". Essas são apenas algumas das muitas experiências que tive em tangaryo. Só quis lhes falar sobre elas para mostrar como minha vida mudou, como houve uma grande transformação depois do meu encontro com o zen. Amanhã falaremos mais sobre o Darma. Depois de um ano em Eihei-ji, passei mais cinco anos em outro mosteiro, o Soji-ji, e então meu mestre recomendou que eu fizesse um curso especial para ser mestre. Aos poucos, comecei a ensinar o zen e o zazen, e como estávamos perto de Yokohama e de Tóquio, apareciam muitos estudantes para visitar o templo e aprender zazen. Minha função passou a ser a de me relacionar com pessoas de outros países. Percebi, então, que havia entre os estrangeiros um grande interesse pelo budismo. O zen de Dogen começou a me interessar cada vez mais, e percebi que havia algo de universal no budismo. Então fui visitar a Índia, a terra do Buda Sakiamuni, e visitei alguns lugares importantes em sua vida. Fui ao lugar onde ele nasceu, onde se iluminou, onde fez seu primeiro sermão e onde morreu. Tive uma impressão muito forte destes quatro lugares sagrados. Encontrei lá peregrinos de todas as partes do mundo e de todos os ramos do budismo: tibetanos, teravadas, chineses, pessoas de Cingapura, do Ceilão, etc. E em nenhum lugar que visitei encontrei tantas pessoas interessadas no budismo como lá. Quero recomendar a vocês que visitem os lugares sagrados de Buda. Comecem a guardar um pouco de dinheiro para poderem fazer essas visitas. Também desejo, se estudarem Dogen, que visitem o Japão, Eihei-ji, mas penso que é mais importante visitar a Índia. Ao visitar o primeiro templo de Buda, senti uma grande tristeza porque ali encontrei apenas ruínas, apenas os alicerces do que fora o templo. Agora há poucos budistas na Índia, e eu me perguntei por quê. Depois da morte de Buda muitas coisas mudaram, e o budismo migrou para outros países. Claro que houve um motivo, por um longo tempo a Índia se tornou muçulmana. E aquele sentimento de estranha tristeza ficou em mim, mas então entendi que o próprio Buda ensinou a impermanência, e compreendi a situação da Índia. Compreendi que o budismo não existe mais lá, mas existe no Ocidente, na América Latina, no Brasil, aqui em Porto Alegre. Então senti que estava tudo bem, que aquilo era apenas um sentimentalismo meu. Hoje, na Índia, Buda é considerado apenas um santo, mas não aquilo que realmente foi, o maior de todos os seres de sua época. Para os indianos, ele é apenas uma entre tantas divindades de sua longa história religiosa. Hoje falei sobre minha primeira visita à Índia, que é um país muito grande, muito interessante e muito religioso. Mais tarde, quero falar especificamente sobre zazen e sobre o seshin de amanhã. Estamos praticando em Porto Alegre e esta é uma experiência nova para mim. Nos países budistas o espírito do budismo vem se perdendo, e por isso falo que as religiões nascem, crescem e depois decaem, como está acontecendo no Japão de hoje. Em 1970, eu estava em San Francisco, na Califórnia, e via os americanos buscarem experiências diferentes, hippies praticando zazen, ioga e outras técnicas de meditação. A impressão que tenho é que aqui no Brasil se dá algo semelhante ao que assisti nos Estados Unidos. Claro que a situação atual do Brasil não é a mesma da Califórnia de então. Estamos em 1994, muito mais internacionalizados, o transporte é mais fácil, os meios de comunicação são mais eficientes. Os brasileiros têm muita sorte. Eles estão praticando o budismo. Hoje pela manhã, depois do zazen, quando ouvi cantar Dai, sai, ge dap-puku, por um momento me senti no Japão, porque todos cantavam em japonês. Então lembrei que estava no Sanguen Dojo de Porto Alegre, fundado pelo reverendo Tokuda, que conheci trinta e três anos atrás, na universidade. E senti que isto aqui deveria ser conservado. Esta é a minha idéia do Brasil, onde existem traduções dos cânticos para o português mas vocês cantam em japonês, o que sugere ligações muito fortes com o Japão. E tudo isso me faz pensar que vocês têm muita sorte. O Centro de Estudos Budistas aqui de Porto Alegre está certamente criando um novo budismo. Penso que precisamos de dois tipos de energia para estudar o budismo, a primeira para os velhos países budistas, a segunda para países novos como o Brasil. E o budismo aqui tem um novo espírito, algo novo está surgindo aqui, como vi acontecer na Califórnia na década de 70 com Shunryu Suzuki Roshi, onde foi desenvolvido um budismo único num país onde antes o budismo não existia. Nasci no Japão, país de longa tradição budista. Aprendi com muitos mestres zen um budismo cheio de cerimônias, técnicas e outras coisas. Mas nos países novos sinto-me renovado, forte. Aqui existe uma energia que não encontro no Japão. Lá tenho o meu templo, muitos discípulos, mas não é a mesma coisa. A energia aqui é uma energia nova. Passei de 1970 a 1973 na Califórnia e voltei ao Japão. A experiência de três anos nos Estados Unidos me deu um grande impulso e eu quis começar um novo Centro Zen Internacional no Japão. Assim, dezessete anos atrás, construí meu templo perto do Monte Fuji. Agora estou em Porto Alegre pela segunda vez e me sinto muito feliz em poder aprofundar o sentido do Darma com todos vocês. Hoje recebi a notícia de que vocês vão iniciar trabalhos de construção para ampliar o zendo. Com o tempo, acho que vocês poderiam ter uma casa nas montanhas. Eu tive experiência com a construção de três casas nas montanhas. A primeira delas foi no Japão, onde tenho amigos e algum apoio, e lá nós compramos, perto do Monte Fuji, uma casa muito simples, sem eletricidade, sem telefone, sem água corrente, onde bebemos água no regato. Quando estou no Japão passo lá os fins-de-semana, com uma dezena de discípulos que têm de viajar uma hora e meia de trem, de Tóquio à montanha, e depois subir a montanha. Os estrangeiros ficam lá mais tempo, de três a seis meses. Joshin Sensei, que esteve aqui em Porto Alegre, ficou lá quatro anos. Minha segunda experiência foi na França, com Joshin. Nós não tínhamos muito dinheiro e queríamos um local não muito caro. Começamos a procurar pelas fazendas antigas, até que encontramos uma casa, e os discípulos foram chegando. Nós a reconstruímos por dentro, e isso levou muito tempo. Era uma casa de pedra, de trezentos anos, e este tipo de casa é difícil de reformar. Para recolocar uma janela são precisos três meses de trabalho. Eu gosto mais das casas de madeira, que são mais fáceis de arrumar. As pessoas da Sanga querem ajudar no trabalho, elas pensam "Este é o meu dojo", e todas trabalham voluntariamente. Isso foi o que vi acontecer no templo de Joshin. Minha terceira experiência foi em San Francisco, em Oakland, perto da Universidade de Berkeley. Um amigo meu, o reverendo Akiba, quis construir um templo e decidiu fazê-lo no estilo japonês. Precisava de um carpinteiro japonês especializado, porque estas construções têm aspectos complicados, como os telhados curvos, que necessitam de peças especiais. Muitas tiveram que ser feitas no Japão e remetidas para lá. Mas a experiência não foi tão boa. O templo de estilo japonês é lindo e consumiu muito dinheiro, mas não pertence à paisagem americana. É um prédio bom para os turistas tirarem fotos, como alguns restaurantes chineses que vi por aqui, com prédios em estilo chinês que destoam e não pertencem à cultura local. A experiência na França foi diferente, é uma casa antiga que foi reformada, de fora ninguém sabe que é um zendo. Mas lá dentro se pratica o Darma. Não se preocupem com belos edifícios, reconstruam casas velhas, sejam simples, o que importa não é o prédio em si, mas o Darma que se pratica dentro dele. Há mais de 30 pessoas praticando o shikantaza, mas o canto do galo não nos atrapalha. A impressão desta minha segunda visita e da prática com vocês é a de que somos velhos amigos no Darma. Não posso expressar com palavras o sentimento de intimidade que me envolve. Isso significa que nós temos a mesma mente, a mente que procura; que temos as mesmas idéias e a mesma esperança. Por isso tenho este sentimento de que temos a mesma vibração. O que quero dizer é que há um tipo de fusão, de integração de uns com os outros. Hoje é um dia muito precioso para vocês e para mim. Nós todos já fizemos muitos seshins, mas aqui, hoje, há mais de trinta pessoas e é muito importante para o Sanguen Dojo e para o Darma que estejamos todos aqui reunidos. Há trinta e dois anos eu era como vocês, estudante do zen, e tinha questões e objetivos que queria resolver. Naquela época eu não era um bom estudante, e nem bom budista. Só queria respostas para os meus problemas. Se vocês praticarem zazen sem objetivos pessoais, o interesse de vocês vai se dirigir para o aspecto religioso da prática. Nesta minha visita, senti que os praticantes de zen estão ficando mais fortes. Quando se estuda é preciso ter um bom professor. Vocês já tiveram o reverendo Tokuda e também Narazaki Roshi, que esteve no Brasil. Um bom mestre nos dá uma confiança maior no Darma. Se praticarmos sem um bom mestre nossa caminhada será insegura, não será reta e ficaremos cambaleando pelo caminho. Com um mestre, podemos estudar budismo de uma maneira mais personalizada. Cada um tem necessidades diferentes. Como o médico que diagnostica individualmente cada doença, o mestre diagnosticará o problema de cada mente. O zazen também vai clarear a nossa compreensão. Eu quero continuar a prática com vocês. Quando me tornei um monge budista, depois de compreender o Darma e receber a transmissão de meu mestre eu lhe disse: "Atingi meu objetivo, que bom, agora sou um monge budista". Meu mestre respondeu: "Muito ao contrário, agora é que você está começando, agora é o começo de tudo." Quando perguntei quando iria me formar ele respondeu, "não existe formatura em budismo, você nunca vai se formar, este é o caminho do bodisatva". E assim é a prática — sempre iniciando, somos sempre principiantes. E isso não é apenas para mim, para vocês é a mesma coisa, por isso temos que fazer o esforço constante de um bodisatva, o esforço que nunca termina. O que estou querendo dizer é: tentem tirar o maior proveito possível do Darma, tentem usar bem o Darma. Tenho, no Japão, muitos alunos de zen, pessoas sérias, que viajam uma hora e meia de trem até a montanha e outro tanto a pé para chegar ao templo. Mas noto que quando retornam a Tóquio nem sempre são bons maridos, bons filhos, e que sua prática em casa não é tão séria quanto sua prática no templo. Lembro de um aluno meu que gosta muito de beber sake e que me disse: "Zazen é bom para mim porque durante os dias em que estou aqui eu paro de beber. Quando volto para casa bebo e o gosto do sake é delicioso. É por isso que venho a este templo". Tudo bem, este é um problema pessoal deste aluno, é um questionamento que ele faz a si mesmo. Fico feliz porque o budismo é bom para ele. Mas a verdadeira prática não é separar a experiência da vida cotidiana da experiência da prática, pelo contrário, é aproximar as duas. O zazen leva as pessoas a transformarem o seu cotidiano. O que vou contar agora não é um bom exemplo do que estou dizendo. Um famoso mestre zen no Japão deu um seshin muito rigoroso, e ao terminar disse: "Que bom que terminou o seshin. Agora vamos fazer uma festa, agora vamos beber." É muito bom podermos ir até o fim de um seshin, mas para mim o seu objetivo é podermos continuar a prática no dia-a-dia. O sentimento que devemos ter é o de que na próxima vez faremos um seshin melhor ainda. Eu me sinto muito feliz, estou sentindo a alegria do Darma porque estou vendo um bebê aqui no zendo. Meus pais poderiam ter me levado a um seshin quando eu era criança. Mas eu comecei muito tarde no budismo, aos vinte e quatro anos, e por isso estou contente com esta presença. Este fato é muito auspicioso, estou cheio da alegria do Darma. Hoje foi o melhor dia que tive desde que estou no Brasil, há um ano e quatro meses. Isto significa que a maneira como vocês praticam o Darma foi um verdadeiro presente para mim. Espero repetir esta experiência muitas vezes, e quero lhes dizer, para encerrar este seshin, muito obrigado. É muito difícil passar ao leitor o clima deste encontro histórico. Por isso, a necessidade deste preâmbulo. Na simplicidade e na espontaneidade, um grande mestre expressa mais ensinamentos do que a palavras a seguir podem oferecer. Moriyama vem de uma cultura milenar. Sobreposto a isto, vimos um homem corporificando uma tradição budista de, pelo menos, 2500 anos de sabedoria. O silêncio de Moriyama falou profundamente. Infelizmente,a presença, o olhar, os gestos, só puderam ser sorvidos pelos entrevistadores. É importante, então, que o leitor considere tudo isto e que a entrevista se deu em inglês – que não é a língua mãe de Moriyama ou de seus interlocutores – idioma que serviu apenas como tosca ponte, cujo mérito residiu em permitir que todos pudéssemos trafegar em ambos os sentidos e desfrutar de um lindo momento. Repare o leitor que, por exemplo, quando usa a palavra "mente"(mind), Moriyama leva a mão ao coração, não à sua cabeça... De nossa parte, procuramos perguntar o que imaginamos ser de interesse do praticante e do público em geral. Contudo, não deixamos de inquirir sobremaneira aquilo que somente um grande mestre poderia responder. Não temos palavras, mas precisamos agradecer a todas as pessoas do Grupo VIAZEN que nos auxiliaram a realizar este trabalho e gostaríamos de dedicar todos os possíveis méritos ao benefício de todos os seres e da continuidade de transmissão dos ensinamentos do Darma. Foi assim, em meio a um retiro, num local ermo e aprazível, que ouvimos a voz de Moriyama Roshi. Bodigaya: -O que é um "Roshi"? O que significa? Moriyama Roshi: -Esta é uma palavra especial do Zen Budismo japonês. É um título honorífico dado nos mosteiros Zen a um professor de alto nível que orienta, leciona ou dá ensinamentos para outros monges. No Japão há muitos monges budistas, mas poucos com este título. Etimologicamente, a palavra Roshi vem da China e significa professor, elevado professor. Bg. : -Há algum teste ou exame? (O mosteiro)Eihei-ji reconhece este título? MR.: -Não apenas Eihei-ji reconhece este título. Não há exames, não é um título obtido através das provas ou teste. É um honorífico(o valor de "honorífico" ou "honradez" na cultura japonesa é gravemente diferente e superior aos padrões comuns vigente para "honra" ocidentais). Bg. :- Por que o Sr. veio ao Brasil e a Porto Alegre? O Sr. tem alguma incumbência oficial à divulgação do Budismo Zen no Brasil? MR.: -O abade do templo de Eihei-ji, no Japão, solicitou-me que viesse a São Paulo representar o Soto Shu na América do Sul. Não havia sacerdote no templo paulista Bushin-ji e, assim, fui nomeado para lá, com esta posição oficial de Sokan. Tenho visitado vários lugares no Brasil, entre eles, o Sangen Zendo em Porto Alegre. A minha missão é de transmitir o Zen Budismo japonês nos países da América do Sul. Bg. : -Como foi sua formação dentro do Budismo? MR.: -Eu me formei em Filosofia na Universidade Kowazawa pertencente ao Zen Soto Shu. Depois, fui para o mosteiro de Eihei-ji como monge e, em seguida, fui ao próximo maior mosteiro Soto Shu do Japão, onde tive uma educação especial como Mestre Zen, isto é, especialista no treinamento de monges; tornando-me professor do Zen. Bg. : -O Sr. sempre aspirou tornar-se um monge e um mestre? Como isso aconteceu na sua vida? MR.: -Eu estava estudando Filosofia na Universidade, então, meu interesse se voltou para a religião comparada e estudei muitas religiões. Assim, meu foco de interesse se deslocou da filosofia para Budismo e daí para o Zen. Então, encontrei meu mestre e me tornei seu discípulo. Bg. : -Que idade o Sr. tinha? MR.: -Vinte e quatro anos. Bg. : -E agora, que idade o Sr. tem? MR.: - (Moriyama brinca com nosso interesse, pergunta nossas idades respectivas, faz comentários, muitos risos.) Tenho cinqüenta e nove anos. Bg. : -E antes da Universidade o Sr. nunca pensou em ser monge? MR.: -Não. Eu tinha interesse em religião, mas não pretendia ser monge. Bg. : -Como o Sr. alcançou um progresso tão rápido? MR.: -Penso que encontrei o melhor mestre Zen do Japão. Esta foi a minha "boa fortuna no Dharma". E tive ainda um segundo mestre Zen que era o próprio Abade de Eihei-ji. É a posição mais elevada no Zen Budismo Soto, equivalente ao Dalai Lama no Budismo Tibetano. Ele se chamava Niwa Roshi. Bg. : -Como é a vida cotidiana de um mestre Zen? MR.: -Temos uma tradição de várias centenas de anos de vida monástica. Seguimos uma metodologia que considera os ensinamentos de Mestre Dogen e é claro, do Buda. Bg. : -O Sr. tem muitos discípulos atualmente fora do Japão? E no Brasil? MR.: - Sim, tenho cerca de oitenta discípulos (leigos) em diversos países como Brasil, EUA, Argentina, Uruguai. França. Alemanha, Suécia, Áustria, Canadá, Coréia e Sri Lanka. Bg. : -O que o Sr. pensa de outras manifestações do Budismo em desenvolvimento no ocidente e desta "efervescência" do Budismo? O Sr. vê algum risco aí? MR.: - O Budismo tem mais de 2.500 anos e existem muitas escolas, muitas derivações (ramos). Sou um professor Zen, não sei muito acerca das outras escolas que foram para diversos países e adquiriram sabores particulares. No entanto, alguns grupos religiosos novos e estranhos surgiram, não para divulgar os verdadeiros ensinamentos budistas, mas apenas para ganhar dinheiro. Este é um perigo real. Bg. : -Estão disponíveis hoje via internet muitos ensinamentos budistas. É possível a uma pessoa praticar sem a orientação de um mestre? MR.: -O que é certo na nossa tradição, o ponto mais importante, é encontrar um mestre. O Budismo originou-se com o Buda e a transmissão aos seus discípulos. Foi por eles que o Buda ensinou. Então, de acordo com a tradição, não se pode praticar o budismo sem um mestre. Esta é a minha visão. Obviamente, nós estudamos para adquirir conhecimentos. Porém, os verdadeiros ensinamentos do Buda não podem ser alcançados sem o auxílio de um mestre. Bg. : - A internet é um sistema global, às vezes com ensinamentos e práticas (incluindo rituais) de grande profundidade ao alcance de qualquer pessoa. O Sr. vê algum problema em alguém praticar a partir dali? MR.: -Estou sempre falando sobre isto: da mesma maneira, se você quer aprender a nadar lendo um manual ou na Internet, você não pode nadar. No Budismo também é assim. Br. : -Você precisa "pular na água"? Bg. : - Há muitas críticas ao orientalismo, à importação de religiões. O Sr. acredita que vai se transpor o Zen Japonês para cá ou irá surgir e se desenvolver um Zen com características locais? Por exemplo, em que língua serão recitados os Sutras? MR.: -Sim, isto é o que é necessário. O Brasil necessita de um Budismo brasileiro, não do Budismo japonês. Vocês criam um novo Budismo; seu grupo, o VIAZEN, cria um novo Zen. O Brasil criará um budismo próprio. De outra forma seria imitação. Imitação não é cultura. Com o Budismo Tibetano é a mesma coisa. Um Budismo Tibetano brasileiro. Bg. : -No Brasil, a mídia passa uma imagem de "uma pessoa Zen" é alguém meio desligado, que acha que está sempre "tudo bem", às vezes beirando mesmo a negligência e o descaso. Como o Sr. vê isto? MR.: -Eu não me preocupo com a mídia. Eu estudei para me tornar monge por 34 anos e não precisei de jornais, televisão, revistas, etc. Nós sempre consideramos a realidade, não a informação. Bg. : -O que é o Zen? Como pode ser ensinado? MR.: -O Zen é a essência do Budismo. Através do Zazen (meditação zen) o Buda alcançou a iluminação. Sou Mestre Zen japonês, então ensino aos meus discípulos a vida monástica japonesa. Os discípulos aprendem através da prática. Bg. : -No que consiste a prática da meditação dentro do Zen? Ouve-se falar em parar os pensamentos, ou em ficar mais calmo e controlado no dia-a-dia. É isso que se procura? Há objetivo na prática? MR.: -Antes de mais nada, precisamos definir a palavra, de outra forma não podemos entender. "Meditação", etimologicamente, vem do latim. Na idéia geral das pessoas, meditar significa pensar profundamente, concentração, consideração. Meditação no Zen não é pensar; é criar, é iluminação, é intuição. Não significa pensar, considerar ou contemplar. Meditação é simplesmente iluminação. O objetivo da meditação é iluminar. Meditação não é um caminho intelectual, é diferente disso, é o oposto. Pensar é analisar. Zen é intuição, iluminação. O objetivo do Zen é o Nirvana. Compreender o Nirvana. Alcançar a experiência do Nirvana. Bg. : -Alguns praticantes do Zen falam de retiros (seshins) onde há muitas horas seguidas de meditação. Isto requer uma dose de esforço e adestramento físico. Como o sr. vê o esforço na prática? MR.: -Seshin é um período intensivo de meditação, não é a prática de todos os dias. Há diferentes níveis de praticantes: iniciantes, intermediários e avançados. Os estudantes avançados querem praticar mais. Então se realizam seshins uma ou duas vezes ao ano. O propósito de vida dos monges é diferente, praticam meditação quatro vezes ao dia. O praticante leigo não necessita de tanto. Pessoas leigas têm responsabilidades na família, na sociedade. Não são monges e não precisam de longos períodos de meditação. Os seshins para leigos acontecem quando eles querem praticar mais e alguns têm uma forte vontade ou disposição mental para sentar ("sitting mind"). Bg. : -No Zen há muitas manifestações culturais: pinturas, poesia, artes marciais, cerimônia do chá, arranjos florais, etc. Como estas se relacionam com o caminho ou prática do Zen? O que é um "caminho" ("Do")? MR.: -"Do" é uma palavra oriental especial, vem da China. Na Filosofia oriental, ao se aprender uma técnica, não somente através do estudo da técnica, se constrói sempre a personalidade. Por exemplo, no caso do arranjo de flores. No pensamento ocidental basta estudar a técnica e a metodologia e está pronto. Mas, na tradição oriental, através do arranjo floral se estuda o significado da vida, construindo a própria personalidade. Então, surge o caminho através do arranjo de flores. Esta é uma visão muito especial. Bg. : -O Sr. recomenda que as pessoas façam meditação por conta própria? MR.: -Na vida moderna, cada vez mais perdemos a calma, estamos sempre correndo, nossa mente está sempre em movimento. Nós realmente precisamos de um tempo especial, puro e claro, ou perderemos o controle da mente. Então, eu sugiro que o tempo livre seja aproveitado para a meditação. Uma vez ao dia é bom, duas vezes é melhor, três vezes é muito melhor. Bg. : - Alguns textos falam do paradoxo de que se deve praticar para atingir a iluminação, mas que não se pode desejar atingi-la. Isto não é incompatível? Como atingir algo(através da prática) sem busca? Como desejar sem desejar? Bg. : - O que é iluminação? Ela pode ser descrita? MR.: - Iluminação é realizar os ensinamentos do Buda. A vida muda. Há uma auto-realização. Não é um estado abstrato. Bg. : - A iluminação acontece subitamente ou é causada, como resultado da prática? Ela tem etapas ou degraus? MR.: - Ambos. Para algumas pessoas acontece como resultado do envolvimento em atividades como a arte; as pessoas passam a expressar a beleza. Para outras, ocorre por intuição, subitamente. Bg. : - Como se tornar iluminado? MR.: - Praticando com um mestre, esta é a melhor forma. Um mestre iluminado espalha iluminação. Bg. : - É possível reconhecer a iluminação em um discípulo? Como? MR.: - É fácil quando o mestre é iluminado. Um mestre iluminado reconhece. Bg. : - A iluminação é algo que acontece só com budistas? MR.: - Eu não conheço outras tradições, só o budismo. Bg. : -O Sr. considera que possa acontecer com outras religiões, com cristãos por exemplo? MR.: -Eu penso que sim. Bg. : -Em que o Budismo Zen pode contribuir nos tempos atuais, nas questões da vida moderna? Há esta preocupação? MR.: -Sim. É o que sempre enfatizo. O Zen Budismo contribui com a paz da mente. Um praticante do Zen pratica a paz da mente, então, como budista, ele oferece aos outros a paz da mente. Bg. : -Quais são as perspectivas do seu trabalho no Brasil, como o Sr. vê o futuro deste contato? Há algum projeto em andamento? MR.: -Eu tenho discípulos, estudantes. A dedicação a eles é a minha missão. Então, os estudantes e discípulos brasileiros criam um novo Budismo e um novo trabalho. Eu simplesmente ensino os meus discípulos. Esta é a minha missão. Bg. : -Mas, não há planos ou projetos? MR.: -Sim, eu tenho um novo projeto. O Grupo VIAZEN vai iniciar a construção de um Centro de Treinamento Zen nas montanhas. Bg. : -Se algum leitor se interessar em seguir o Budismo Zen ou em ser seu discípulo direto, o que deve fazer? MR.: -Visitar o VIAZEN. Será bem-vindo. Estou esperando. Bg. : -A Bodigaya ficaria honrada em poder ajudar. Se algum leitor quiser apoiar o seu trabalho, a construção do Centro, a quem deve se dirigir? MR.: -Novamente, dirija-se ao VIAZEN. em todos os países acontece o mesmo. No próximo século uma nova era espiritual será alcançada e isto é muito importante. Por outro lado, a tecnologia crescerá cada vez mais e as pessoas não poderão acompanhá-la. Se cada pessoa não tiver uma filosofia verdadeira, um significado. um objetivo, haverá mais sofrimento e preocupações. É por isto que cada país procura um mestre espiritual verdadeiro como, por exemplo, o Dalai Lama. Por isto ele recebeu o prêmio Nobel. Às vezes os grupos religiosos são muito sectários, pensando que são os melhores e que os outros estão errados. Felizmente, em Porto Alegre nosso grupo iniciou no Centro de Estudos Budistas a quatro anos atrás. Sou muito grato a Aveline, grato aos seus ensinamentos, alguns dos meus discípulos estudaram com ele. Por isto eu quero continuar mantendo boas relações com o grupo budista tibetano. Nós somos budistas. Eu sou um mestre Zen japonês, o Budismo tibetano tem o Rimpochê. o Budismo Teravada tem um mestre Teravada. Nos respeitamos mutuamente. A palavra moderna é globalização. O próximo século será muito bom para o Budismo, tenho idéias muito esperançosas. Isto significa que o Budismo brasileiro se desenvolverá porque o Brasil é um país muito novo. Claro está que o Budismo Zen Soto Shu veio ao Brasil muitos anos atrás, mas até bem pouco tempo restringia-se a comunidades japonesas. Agora está se espalhando. Felizmente com professores brasileiros, Daijo San no Espírito Santo, Cohen San em São Paulo. Penso que, de agora em diante, aos poucos, mais monges Zen brasileiros se formarão, o mesmo acontecendo no budismo tibetano. 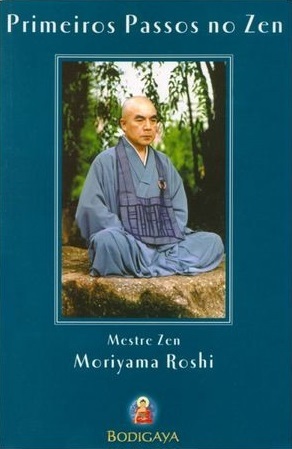 Neste livro único, encontramos os ensinamentos preciosos do grande Mestre Zen Moriyama Roshi, um Patriarca do Zen. Com uma linguagem clara, cheia de simplicidade e beleza, mas sem ser superficial, ele passa todos os elementos do Caminho Zen, desde a prática da meditação Zen (ou zazen) até os aspectos mais sutis da mente, para todos os leitores interessados em trilhar esta maravilhosa jornada espiritual budista. moved to Porto Alegre to lead his sangha. He returned to Japan in 2005.
religions are created, evolve, and degrade, and this is happening in Japan now. Brazil there is a kind of energy that I don't find in Japan. Porto Alegre and, together with his sangha, is building a monastery in the countryside. by not offering the regular set of services to the surrounding community. students access to this practice. in Rio Grande do Sul state. Zen Buddhism in Brazil: Japanese or Brazilian? Buddhism was introduced into Brazil by the Japanese immigrants who first arrived in 1908 at the port of Santos, in Săo Paulo State. Emigrating to work at the coffee, cotton, and banana plantations, they intended to return to Japan as soon as they had amassed the necessary means. At the end of the nineteenth century, Japan was leaving the feudal system behind and going through a period of economic difficulties; the rural population was especially hard hit. Consequently, the Meiji Government (1868-1912) wanted to relieve pressure on the land, while creating colonies that would grow food for export back to Japan. (1) The Brazilian Government, on the other hand, needed laborers for the plantations since slavery had been abolished. Brazil had become independent in 1822, but by the end of the century, the ideas of abolitionism and republicanism were everywhere. Both movements were successful: the abolition of slavery was ratified in 1888, and Brazil became a federative republic in 1889. The lack of Buddhist rituals is possibly due to the Meiji period (1868-1912) ideology and its radical nationalism. This ideology shunned foreign religions and philosophy such as Buddhism and Confucianism, while it deified the emperor. In 1868, a decree instituted a distinction between the Shintoo deities and the Buddhist pantheon, which previously had been syncretized. Buddhist monks who dwelled in Shintoo shrines were expelled, and Buddhist altars in the compound were destroyed. Anti-Buddhist movements (Haibutsu Kishaku) escalated(15) This is the milieu in which the Japanese immigrants lived before departing for Brazil. When Japanese religions arrived in Brazil—and hence infringed upon the Japanese Government's edict that no preacher should emigrate—however, they suffered restrictions and threats. This was the case of new religions such as Tenrikyoo, which arrived in 1929, Oomotokyo, and Seicho-no-iee. (16) ) During World War II, Japanese schools were closed, Japanese language newspapers were prohibited (there were four Japanese daily newspapers published in Săo Paulo with a total circulation of around fifty thousand), and speaking Japanese in public and private (including houses of worship) was banned. But when the fear of the "yellow peril" weakened because Japan lost the war, Japanese Buddhist schools began sending missionaries to Brazil to proselytize. Nevertheless, although the idea that Buddhism was not disseminated in Brazil prior the World War II is supported by many authors (Lesser, 1999; Clarke, 1999; Nakamaki, 1994; Comissăo de Elaboraçăo dos 80 anos da Imigraçăo Japonesa no Brasil, 1992; Saito, 1973, 1980; Saito & Maeyama, 1973), one author contradicts this idea. The historian Ricardo Gonçalves affirms that the first ship, Kasato Maru, which docked in Brazil in 1908, carried a priest from the Honmom Butsuryo (a branch of the Nichiren school) on board. This monk later established a temple in Bauru, in Săo Paulo State. Subsequently, a priest from the Shingon school arrived, and in 1925, the first priest from the Joodo Shinshuu school arrived. In 1932, Joodo Shinshuu established the first Brazilian Buddhist temple in Cafelândia in Săo Paulo State. (18) Although it is perfectly acceptable that there were Buddhist congregations in Brazil prior to World War II, the idea that immigrants' lives were centered around the cult of the Emperor is also an acceptable supposition. Both theories can be seen to complement one another if scholars accept the fact that although there was Buddhist activity before World War II, it actually only became institutionalized after the 1950s. All of these authors agree that after World War II, the religious institutions in Japan sent official missionaries to establish temples and proselytize. Even so, this contention needs to be further studied. Zengenji was the first Sootoo Zenshuu Zen Buddhist temple in Brazil. Built in the early 1950s in Mogi das Cruzes, a town on the outskirts of Săo Paulo City, Zengenji was constructed with Japanese Sootoo Zenshuu funds and the help of the Japanese community who lived in its vicinity. The Busshinji temple was built in 1955 in Săo Paulo City to be the headquarters of the Sootoo Zenshuu school in Brazil. It was also built with Japanese community funds and Sootoo Zenshuu funds. These two temples, together with the temple in Rolândia in the state of Paraná, catered to the Brazilian Japanese community for three decades. During this time, their missionary work gained 3,000 families as followers. In 1955, the Sootoo Zenshuu Buddhist Community of South America (Comunidade Budista Sootoo Zenshuu da América do Sul) was established and officially recognized by the Brazilian Government. In the same year, the Buddhist Society of Brazil (Sociedade Budista do Brasil) was founded by a Brazilian of non-Japanese origin (Murillo Nunes de Azevedo) in Rio de Janeiro. Azevedo was the first Brazilian interested in studying Buddhism "as a philosophical and artistic system." He was a professor of philosophy at the Pontifical Catholic University in Rio de Janeiro, where he taught philosophy of the Far East. The Buddhist Society of Brazil organized lectures and exhibited films on Buddhism supplied by the Indian and Sri Lankan embassies. 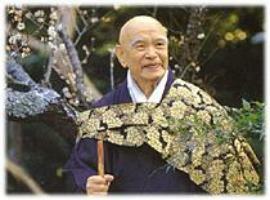 (19) In 1961, Azevedo translated the Introduction to Zen Buddhism by D. T. Suzuki into Portuguese. However, mass interest in Buddhism and Zen by non-Japanese Brazilians did not occur until the 1990s. The schools of Nishi Hongwanji, Higashi Hongwanji (Joodo Shinshuu), Joodo Shu, Nichiren, and Sootoo Zenshuu sent missionaries to Brazil in the early 1950s. The missionaries sought Japanese families who were associated with such Buddhist schools in Japan prior to their migration to Brazil. In 1958, all of these Buddhist schools were united in the Federation of the Buddhist Sects of Brazil (Federaçăo das Seitas Budistas do Brasil). Brazilians of non-Japanese descent began seeking Zen Buddhism starting in the late 1970s. In 1968, Sootoo Zenshuu headquarters sent the Japanese monk, Ryotan Tokuda, to the Busshinji temple in Săo Paulo as a missionary. Upon arrival, he opened the temple to non-Japanese Brazilians. Working together with these new practitioners, Tokuda founded the first Zen monastery of Latin America, Mosteiro Morro da Vargem, in the state of Espírito Santo in 1976. In 1984, Tokuda established a second monastery, Mosteiro Pico dos Raios, in the state of Minas Gerais. Today their abbots are Brazilians of non-Japanese origin who were disciples of Tokuda and studied in monasteries in Japan. Daiju (Christiano Bitti) became the abbot of Morro da Vargem monastery in 1983 after spending five years in Japan. This Zen monastery is visited by four thousand people annually and receives seven thousand children of the state each year who go there to learn environmental education. (20) Besides having maintained an ecological reserve and the Center of Environmental Education since 1985,(21) the monastery established a "House of Culture" to patronize fine artists who subsequently can devote themselves to creating their works away from the city. In addition, Morro da Vargem monastery holds eight five-day retreats each year with forty-five attendants at each session. The people who attend these retreats are not necessarily Buddhist, as Daiju suggested: "In general, the people who seek the monastery do not profess any religion. They are in search of spiritual peace. "(22) Pico dos Raios monastery is also linked with the external community. Tokuda teaches acupuncture to the monastery's practitioners who offer this service to the local population. 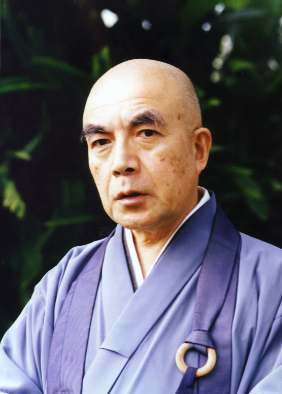 In 1984, Ryotan Tokuda established the Sootoo Zen Society of Brazil (Sociedade Sootoo Zen do Brasil), whose headquarters are at the Pico dos Raios monastery. In 1985, the Center of Buddhist Studies (CEB) was created in Porto Alegre, which is the state capital of Rio Grande do Sul. CEB comprised practitioners of several schools of Buddhism, including Zen. In 1989, Tokuda and CEB's Zen practitioners inaugurated the temple Sootoo Zen Sanguen Dojô. Currently the temple follows the orientation of Daigyo Moriyama Rooshi and his French disciple, Zuymyo Joshin Sensei. Moriyama is a Japanese rooshi who has disciples in Brazil, Argentina, Uruguay, USA, France, Germany, Sweden, Austria, Canada, Korea, and Sri Lanka. (23) Continuing his missionary work among non-Japanese Brazilians, in 1993 Tokuda founded the Zen Center of Planalto in Brasília, the federal capital. In the future, the center plans to establish a Brazilian Buddhist library and a Brazilian Buddhist university. In the following year, Tokuda and Brazilian practitioners founded the Zen Center of Rio de Janeiro. In 1998, Tokuda established the Serra do Trovăo monastery in the state of Minas Gerais. This monastery was founded exclusively for the training of new monks and holds two seven-day retreats monthly. It is important here to note that Ryotan Tokuda has a connection with European Zen. He has Zen groups in Italy, France, and Germany. In 1995, Tokuda founded the École Nonindo de Medicine Traditionelle Chinoise and the Association Mahamuni, both in Paris. Because the monasteries, temples, and Zen centers—all of which were established after 1976—cater mainly for non-Japanese Brazilians, there are no conflicts over which practices of Zen Buddhism are performed. Yet, when Japanese immigrants and non-Japanese Brazilians share the same place, dissension arises. This is the case for the temple Busshinji in Săo Paulo. Inaugurated in 1955 and catering for the needs of the Japanese community for more than three decades,(32) Busshinji suffered considerably when a new abbot was appointed by the Sootoo Zen school in Japan. In 1993, Japanese monk Daigyo Moriyama Rooshi arrived in Săo Paulo with new ideas about how Zen practice should be. That is why I put my energy in a foreign country; here Zen Buddhism can be created again in a purer way. Japanese Buddhism is changing Buddha's and Doogen's teachings (Personal interview, 1997). 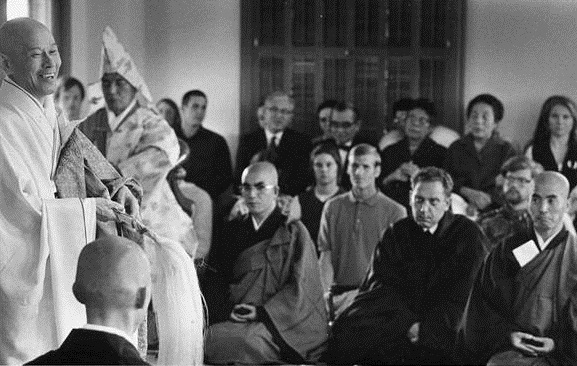 However, upon his arrival in Brazil, the rooshi encountered a Japanese community that demanded him to perform the same things that he was not willing to do in Japan, that is, "masses" (as the members of the sect denominate the rituals in Brazil), weddings, funerals, and worship of ancestors, instead of a practice based on meditation. The conflict became even more serious when the Japanese rooshi met a group of Brazilians of non-Japanese origin who were quite interested in meditation and in Buddha and Dogen's teachings. From the moment that these Brazilians entered the temple and began to interact with the Japanese-Brazilian community, conflicts arose. As a result, in 1995 the headquarters of the Sootoo Zenshuu school in Japan released Moriyama Rooshi from his services due to the Japanese community's strong pressure. In Japan, the abbot, as a first-born son, inherits his temple from his father. In Brazil, the Japanese community owns the temples. As a result, Japanese missionaries (who are appointed by the Japanese headquarters) have to prove that they are good proselytizers. Because the Japanese community was dissatisfied with Moriyama's work, he was called back to Japan by the Sootoo Zenshuu school. A number of his Brazilian followers also left the temple and founded a new Zen center (Cezen) in Săo Paulo where the rooshi is a spiritual mentor. Moriyama continues to travel to Brazil independently twice a year to visit his disciples, promote retreats, and give Dharma talks at his two Zen centers located in Săo Paulo and Porto Alegre. When Moriyama was in charge of the temple, he tried to adapt Japanese Zen to Brazilian culture. It was more flexible. With Koen, as she recently arrived from Japan, she tries to maintain the patterns and rules by which she lived in Japan. She tries to impose everything, the rhythm, behavior and discipline of the Japanese practice. She is very inflexible (Cida, 40 years old, astrologer). What makes this case more interesting is that traditionally, the Japanese-Brazilian community maintained some diacritical cultural traits preserved and away from Brazilian society (among them were the language and the religion) for the maintenance of its ethnic identity. (35) Although second and third generations have started assimilating into Brazilian culture (36) and are quite integrated into the country today, the abbess position in the only Zen Buddhist temple in Săo Paulo is not one that the community can leave in the hands of a "foreigner." How, then, did a Brazilian nun get the highest position in a Buddhist sect, and furthermore, how could she have been accepted by the Japanese-Brazilian community? Although Koen is a Brazilian nun, she slowly gained acceptance because she worked hard at preserving the rituals that the Japanese community expected to be performed. At the same time, by speaking Japanese and Portuguese fluently, she served as a successful intermediary between the Japanese and Brazilian communities. This conflict of motivations, practice, and aspirations is one that has occurred in similar Western contexts, be it in Buddhist centers in the United States or Europe. In spite of the fact that the Japanese community and Brazilians of non-Japanese descent have separate practices in Busshinji, one must take care not to think of cultures as "organically binding and sharply bounded. "(37) Between the Japanese community and Brazilian society at large, there are Japanese descendants who were educated according to both Japanese and Brazilian custom, and as a result, display mixed cultural patterns. They dwell in the interstices of society and comprise a small group of practitioners who began going to the temple because of family pressure and have ended up attending the activities offered for Brazilians of non-Japanese origin. Many Japanese descendants told me in interviews that one of the deciding factors for choosing to be affiliated with "Brazilian Zen (or 'convert-Zen')" over the "Japanese community Zen" was the language spoken because most Japanese descendants do not understand the Japanese language, which is spoken at the rituals for the Japanese community. In fact, Portuguese is beginning to be recognized as the official language of Busshinji Temple. In 1998, for the first time, there were two parties vying to run Busshinji's administration: one composed of the old traditional Japanese board and a new party comprising Brazilians of Japanese ancestry. The latter won and began enforcing an adaptation of Zen Buddhism to Brazilian culture; for example, they required that suutras be translated into Portuguese, sponsored lectures on Zen Buddhism given in Portuguese, and started study groups of suutras. In addition, they set up retreats for children and began giving assistance and computer courses to prisoners, as well as providing help to AIDS patients. Traditional activities like rituals, funerals, and ancestor worship that cater for the Japanese community are still performed, but they are separate from the activities of the Brazilians of non-Japanese origin. The first processive mode, that of contact, comprises strategies of adaptation such as the translation of scriptures. Translation is one of the main concerns of monks, nuns, and practitioners in all Zen centers, temples, and monasteries where Brazilians of non-Japanese descent are involved. Not only are suutras translated, but also recitations that are used in retreats before meals and manual labor (samu). Though translated, these recitations are chanted using a Japanese rhythm, that is, stressing each syllable as those speaking the Japanese language do. In addition, Brazilian Zen centers produce written materials in Portuguese that discuss the meaning of ordination, provide explanations and drawings on how to sit zazen and do kinhin (walking meditation), and transcribe lectures by the rooshi or monk in charge of the group. Furthermore, new means of communication such as websites are used to spread the word. (39) Produced by most Zen temples, centers, and monasteries, these websites include schedules of activities; articles about the history of affiliated temples, monasteries, and Zen Centers; translated suutras; and pictures of temples and monasteries. The contact mode can lead to the second processive mode of transplantation: confrontation and conflict. Confrontation happens when "protagonists of the imported religious tradition are concerned with presenting the peculiarities which contrast with existing traditions. "(40) The Japanese Ministry of Foreign Affairs avoided this when it prohibited Japanese monks from going to Brazil to proselytize before World War II. As shown earlier in this paper, there were already enough cultural conflicts between Brazilians and Japanese; the Japanese Government could not afford a religious one. Conflict actually arose when the Japanese community and Brazilians of non-Japanese descent started sharing the same religious space in Busshinji. As we mentioned above, the Japanese community and Brazilians of non-Japanese descent do not accept the other group's practices as "true" Buddhism. "Ambiguity and adaptation" is the third processive mode of transplantation. Baumann explains that there are unavoidable misunderstandings and misinterpretations that happen when transplanting a religion into a new sociocultural context. "For members of the host culture it is only possible to interpret and understand symbols, rituals or ideas of the imported religious tradition on the basis of their own conceptions. The bearers of the foreign religion share similar problems of understanding with regard to the new culture and society. As a consequence of contact unavoidable ambiguities arise. "(41) Because of the prevailing Roman Catholic environment, much of the terminology used in speaking of Buddhism in Brazil is Roman Catholic in origin. For instance, rituals such as funerals are called "missas" (masses); the abbot is called "bispo" (bishop); and there are mentions of "paraíso" (heaven), "inferno" (hell), and "rezar" (to pray). Furthermore, there are also intentional ambiguities that are part of a strategy to make the foreign religion less exotic to the host culture, and by doing so, reduce conflicts. This involves emphasizing similarities and links with concepts of the host culture. Such ambiguous delineation can be observed at Busshinji, where Brazilian holidays are commemorated with the Japanese counterpart. For instance, Children's Day (October 12) in Brazil is commemorated on this date, but with a festival for Jizo, the bodhisattva who looks after children in Japan. In addition, the Brazilian "Day of the Dead" (November 2) is commemorated on this date, but with references to Obon, the Japanese festival for the deceased ancestors. Baumann adds that a foreign religion may borrow features of the host culture, for example, organizational structures. All of the temples and monasteries in Brazil comply with Brazilian law and are registered legally as non-profit organizations. In addition, they are managed as a Brazilian organization would be: the temple in Săo Paulo and the Zen centers all over Brazil have a democratically elected president and a board of directors. The fourth mode, "recoupment or re-orientation," is a critique of the ambiguities that have arisen. The foreign religion tries to reduce the ambiguities in order to regain the identity of the religious tradition. One of the examples that Baumann uses is the ordination of Tibetan lay people. When Tibetan Buddhism arrived in Germany, the Buddhist refuge ceremony was given immediately to people attending ceremonies. However, a decade later, initiations are only offered after a thorough preparation. Such is the case of Brazilian Zen Buddhism. Until the 1980s, traditional Japanese monks gave ordination to Japanese descendants without any process or preparation. Likewise, in the 1990s, Moriyama Rooshi gave lay ordination to Brazilians of non-Japanese origin when requested. However, after arriving from Japan, abbess Koen started to carry out rituals more formally and strictly, establishing a two-year preparation course prior to lay ordination. The last of the strategies of transplantation, "innovative self-development," deals with the creation of new forms and innovative interpretations of the religion in the host culture. This generates a tension with the tradition from which the religion developed. Many innovations took place in the United States and Germany. Feminism determined a new status for women in Buddhism. Another example is the democratic organization of Zen centers instead of strict hierarchy. In Brazil, the tension between Japanese Buddhism and Brazilian Buddhism marks the innovations that are occurring. Such innovations are mainly being imported from the Western discourse on Zen. The appropriation and construction of Zen that took place in many Western countries had a similar departing point. D. T. Suzuki—one of the first Japanese scholars to write on Zen in English—and the Kyoto school scholars were fundamental to the creation of a discourse on Zen in the West. As Robert Sharf observed, for Suzuki Zen was "pure experience—ahistorical, transcultural experience of 'pure subjectivity' which utterly transcends discursive thought. "(45) Sharf argued that Suzuki was writing during the period of Nationalistic Buddhism (Meiji New Buddhism—Shin Bukkyoo) "as a response to the Western universalizing discourse." Under this pressure, Suzuki and many other writers such as Okakura Kakuzoo, Watsuji Tetsuroo, Tanabe Hajime, and Nishida Kitaroo—influenced by the ideas of nihonjinron (the discourse on and of Japanese uniqueness)—struggled to recreate Japanese national identity as something special that was identified with the Way of the Samurai and Zen Buddhism. For these authors, Zen, as the very essence of the Japanese Spirit, would denote the cultural superiority of Japan. Moreover, because it is experiential and not a religion, Zen was able to survive the enlightenment trends of the West and was viewed as rational and empirical. 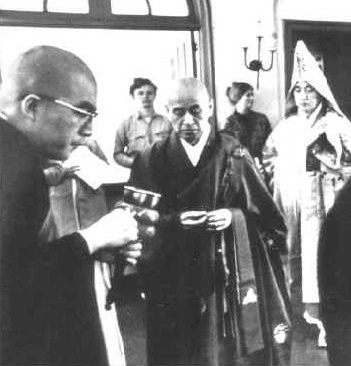 (46) The global expansion of Zen Buddhism carried Shin Bukkyoo ideas with it. However, they were appropriated, indigenized, and hybridized locally. Similarly, Brazilian Zen took part of this process of Zen Buddhism "glocalization" (a process that Roland Robertson terminologically specified as the blending of the local and the global). (47) The interviews that I conducted with Brazilian practitioners of non-Japanese origin showed that their interest in Zen Buddhism is a result of the United States' influence, through the media, (48) books on Zen,(49) movies,(50) and travels. In fact, all of the people interviewed noted that their first contact with Zen was through books. (51) The United States is a strong source of ideas and material on Zen for various reasons. For example, English is more accessible to Brazilians than Japanese. In fact, most of the books on Zen now available in Portuguese were originally written in English. Moreover, due to the fact that these practitioners come from the intellectual upper-middle class and the vast majority are degreed liberal professionals, many of them can read the books in English before they are translated. Some buy books about Zen via the Internet from Amazon (www.amazon.com) and/or subscribe to American Buddhist magazines such as Tricycle. Some practitioners even choose to travel to Zen centers abroad. The French anthropologist, Louis Dumont, argues that in the contemporary world, religious practice is a private choice. (53) In a process of bricolage, the practitioner chooses characteristics from different practices to condense them into a spiritual quest. Thus, each practitioner constructs his or her religion as a unique praxis that is different from all the others, mixing various traditions in order to build a new contemporary spirituality. There are several groups of practices associated with Zen Buddhism in Brazil that are recurrent in the interviews: practices of healing (yoga, Shiatsu, Do In, Tai Chi Chuan, acupuncture); practices of self-understanding (many kinds of psychotherapy, astrology); martial arts (Ai Ki Do, karate); eating habits (vegetarianism, macrobiotics); and other religions (Spiritism, African religions, Mahikari , Rajneesh/Osho). The Western construct of Zen, which was appropriated, hybridized and indigenized in Brazil, is still a new phenomenon that needs to be further studied. This article is intended to be a first outline of the main trends of this phenomenon. Though the Japanese community in Brazil has been leaving Buddhism behind and adopting Roman Catholicism as a means to be accepted in the new country, many Brazilians of non-Japanese descent have recently been adhering to Buddhism, as we saw in this paper. For these Brazilians of non-Japanese origin, the main practice of Zen Buddhism involves meditation (zazen) and retreats (sesshin). Zen Buddhism is seen more as a philosophy than a religion. As such, Zen as practiced in Brazil is directly related to the Western construct of Zen. Among the new features of Brazilian Zen is a retreat for children and teenagers that takes place twice a year (during school holidays) in Busshinji, the temple in Săo Paulo City. In general, the children's parents are adherents of the temple. Interestingly, in these retreats, children of both Japanese origin and of non-Japanese origin learn zazen and Buddhist concepts through drama sketches, drawing, and games. Although their parents have separate practices, the children are already sharing the same body of ideas about what Zen Buddhism is. Since 1999, Busshinji has also been innovating through its work with prisoners (teaching them zazen and also giving computer classes) and AIDS patients. This is the first manifestation of so-called "engaged Buddhism," which is more frequently seen in the West. Furthermore, Koen, the Busshinji temple's abbess, is also establishing inter-religious debates with Roman Catholic orders and is regularly invited to give lectures at universities across Brazil. In addition, different Buddhist schools in Brazil are getting together in Cyberspace. Many Buddhist centers are linked together by means of websites. There are three ecumenical discussion forums and two mailing lists on the Internet produced in Brazil for Brazilian practitioners. In the printed medium, most of the Buddhist centers have a newsletter in which they communicate their schedule of activities, publish book reviews, and advertise books and products on practice. There are also four Buddhist magazines published quarterly in Brazil. Two of them are exclusively Zen Buddhist: Flor do Vazio is published in Rio de Janeiro, and Caminho Zen is published in Japan by the Sootoo school in the Portuguese language, and is intended specifically for the Brazilian market. Bodigaya and Bodisatva comprise articles that mostly center on Zen, Tibetan and Theravaada Buddhism. The phenomenon of Buddhism is still very recent in Brazil. It has evolved much faster in the last decade than in the previous ones. Although much of what has been done was mirrored in the experiences of Buddhism in the United States and Europe, some of its Brazilian characteristics are already clear. Although incipient at this stage of formation, we are able to observe the merging of Buddhist teachings and rituals with non-Buddhist practices and concepts. Many practitioners had and still have a Roman Catholic background and migrated to African cults and Spiritism before finding Buddhism. A bricolage is evolving that, in due course, might create a Brazilian Zen and Brazilian Buddhism, innovatively combining the local and the global in a regionalized form of Buddhism.